Corned beef has been a part of Filipino staple food not only for breakfast but it has been more popular when the eatery business introduce the “silog” meal such as Tapsilog short for tapa with itlog (egg), Longsilog (Longganisa with egg), and the Cornsilog (corned beef with egg). It is also being used in other recipe in replacement to ground beef. The curing method is applied in corned beef making. This involves the application of salt, sugar, nitrate, and other chemical preservatives that kill micro-organisms or delay microbial action. 2. Cut meat into 1 1/2inches. The best beef cut is brisket (punta y pecho) but any cut will do. 3. Prepare the cover pickle (40 salinity). Immerse the meat in the cover pickle. 4. Cure at room temperature for 8-10 hours or in a refrigerator for 1-2 days. After curing, wash meat for 20 seconds to remove excess salt. 5. Cook in pressure cooker for 45-60 minutes or in open fire for 4-6 hours. Mix the cooking ingredients with 2 cups of water. 6. Remove meat from the stock (sabaw) and flake. 7. Pack in polyethylene bags and keep inside a freezer. • 1kg. 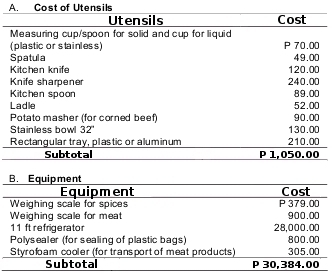 meat will produce 700 g. of lean and 300 g. of stock (sabaw). dissolved in ¼ cup water. To increase yield, add 100-200 g. of pork skin to the meat before pressure cooking. After mixing all ingredients with the 1 kg. meat, finished product should weigh a total of 1.3 kgs. * The higher the volume of production per day (i.e., more than 35 kgs. ), the lower the production cost, thus increasing the markup to more than 10%. * If price per kilogram is lower compared with the existing market price, increase markup to more than 10%. It seems this recipe is easy to make. Thanks for sharing. Nice recipe. 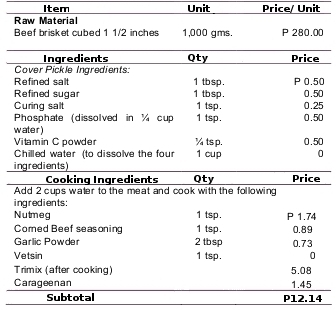 I will try this corned beef recipe.